Arthritis is the inflammation to one or more joints of the body. The primary symptoms are pain and joint stiffness which can vary greatly from person to person, joint to joint, and/or day to day. The most common types of arthritis are osteoarthritis and rheumatoid arthritis. Patients with arthritis often benefit from physical therapy by assisting them with self management strategies, symptom relief,and preserving pain-free function. 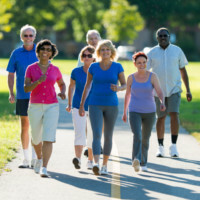 Our therapists have developed a program of evaluation, education, and exercise to address the specific needs of individuals with symptoms related to arthritis. We combine research-based exercise strategies with concepts of cardiovascular exercise in order to achieve a patient-centered management program. The primary focus of the program is to educate patients regarding the appropriate responses and warning signs that result from applying stress and loading to inflamed or degenerative tissues. ​We believe this program of teaching self management and emphasizing the patient's abilities over their disabilities can modify adverse psychosocial factors that limit patient success.